Originally post at Steemit.com here. Tissue salts for tooth decay: Prevention and Healing. Tissue salts are low potency homeopathic remedies that can be used to help balance assimilation of minerals, sooth pain and deal with inflammation. Tissue salts can safely be used from birth and are beneficial during pregnancy. For best results, pair tissue salt treatments with some great dietary enhancements. Doses should be given in homeopathic solution for best results. This limits the amount of sugar given [the tablets themselves are sucrose based] and shaking the remedy raises the potency ever so slightly each dose, presenting the body a new homeopathic stimulus. For ongoing tooth decay give a dose 2 times daily. For maintaining teeth [& healed teeth] dose 1 times daily. You can use either Combination R [“Infant Teething Combination”] or combination U, which are ideal for tooth health. Combination R should be chosen where there is bad pain with teething or tooth decay. For symptoms associated with: Toothache, tooth decay, abscessing. Calc Fluor – For strengthening and remineralising teeth and bones. Encourages correct and adequate growth of the palate, leading to straighter growth of teeth. Helps with gum and dental pain. Calc phos – for assimilation of calcium when needs are high & tooth remineralisation [as per calc fluor]. Nat Phos – balancing acidity and blood sugar. Also is a remedy that can help with tooth grinding. Silica – may prevent and treat abscesses. Ferr phos– for inflammation of gums [and anaemia]. Mag phos – for tooth health & pain relief. 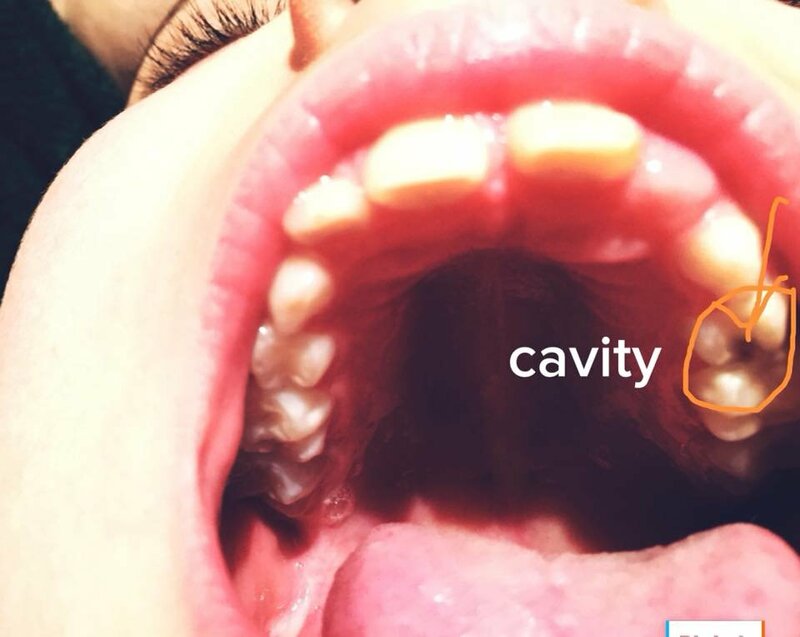 Here’s a very advanced cavity my daughter [age 9 at the time] healed. You can see how extensive the cavity was. 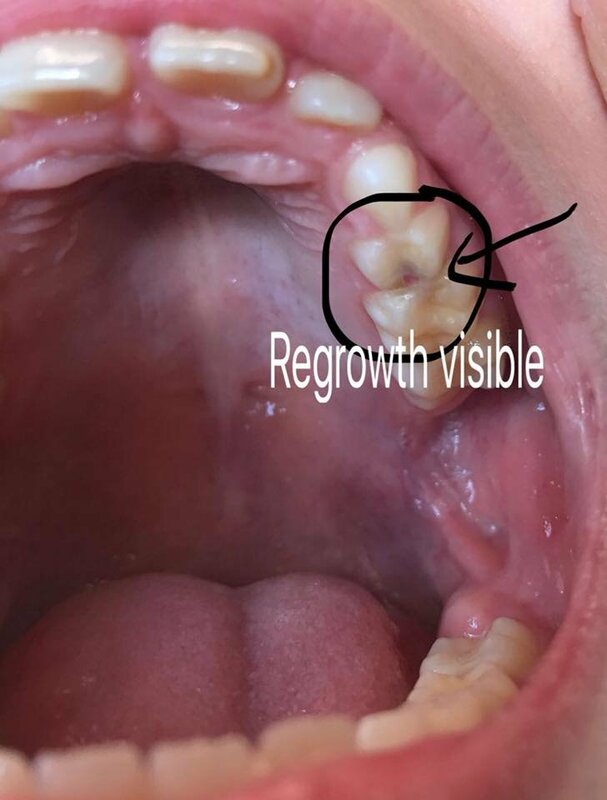 It has left substantial parts of the affected teeth missing but there is no decay or discolouration left. I suspect the decay was too far advanced for the tooth to replace itself. Here are ‘before & after’ pictures from a child I treated for tooth decay [posted with permission]. These pictures were taken a while ago and the tooth is intact and white now. The second picture shows the tooth recovered with a slight grey discolouration. Sally I’m wondering specifically which cell salts/homeopathics you used for the cavity shown in the picture? Hi Tricia, I think calc phos and calc fluor. How long was the treatment in both cases? Thank you in advance for your answer!